The summer season is winding to a close and new products are on the way. Before we start getting into all the new chairs, desks, and tables the remainder of 2017 will have to offer, we thought it would be helpful to take a look back. Brands like Mayline, Modway, and Global rocked the summer season with innovative workplace solutions that will no doubt be trending for years to come. Sit to stand operating is the latest craze. Why you ask? Because when you sit for long periods of times, even the best posture habits start to suffer. 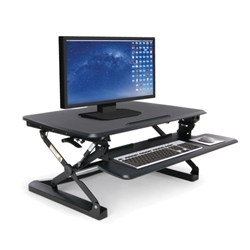 This season, the MooreCo model 27614 Beta sit to stand workstation on wheels was super popular. It's ready to keep you efficient and working healthy on the go! Much like the Beta workstation from MooreCo, the OFM 5100 model desk surface riser was super hot this summer. 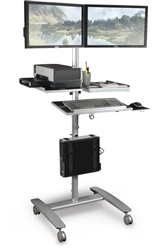 It promotes sit to stand operating and reduces the need for extended chair-based work sessions. The 5100 works with almost any desk top and costs just $279.99. The chairs from the Global Spritz seating collection offer the perfect combination of style and comfort. 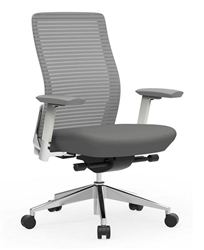 Spritz chairs encourage healthy posture with their weight sensing mechanisms, firm mesh backs, and adjustable arms. The iDesk collection is fully loaded with designer chairs that are ready to impress. Take one look at the Crazy Horse and you'll quickly see what we mean. 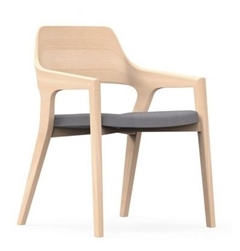 This mid century modern guest chair with a wood frame is perfect for upscale waiting areas. Cherryman never fails to impress. Year after year they deliver innovative new products that combine comfort, value, and appeal. This season no office chair was hotter than the Eon. 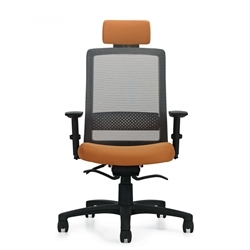 This mesh back task chair for everyday computing is a favorite of industry professionals and design teams. At just $294.00 it's a fantastic buy. It doesn't get much cooler than the office furniture from the Mayline Sterling collection. In finish options like Textured Driftwood, Sterling collection executive office desks and conference tables will help you create a modern coastal vibe that earns regular compliments from valued guests. Sold in affordable 4 packs for $635.00, Woodstock Marketing Sha Na Na chairs are perfect for training room applications. They provide value and durability that's sure to benefit your business for years to come. 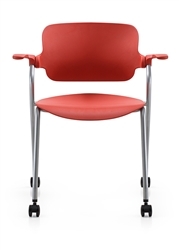 These versatile chairs with easy to clean surfaces are available in 4 quick shipping color options.